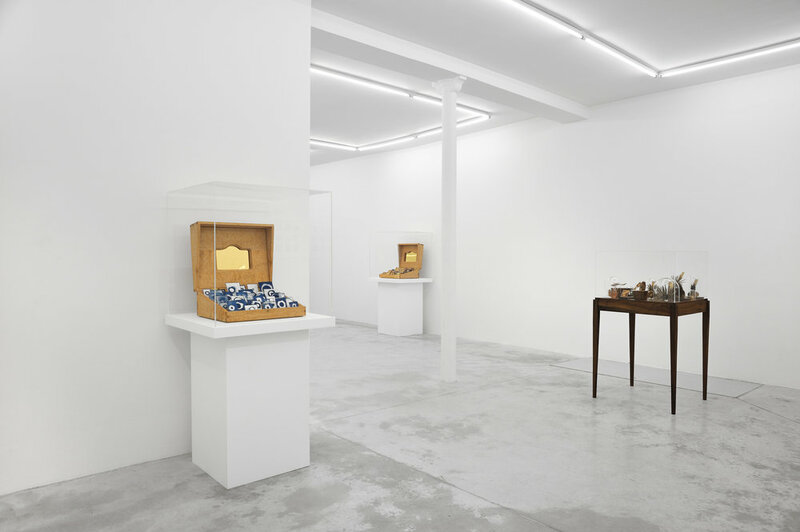 Praz-Delavallade is pleased to present Dario Robleto’s latest exhibition ‘The Dismantled Sun’ which comprises sculptures, installations and works on paper. 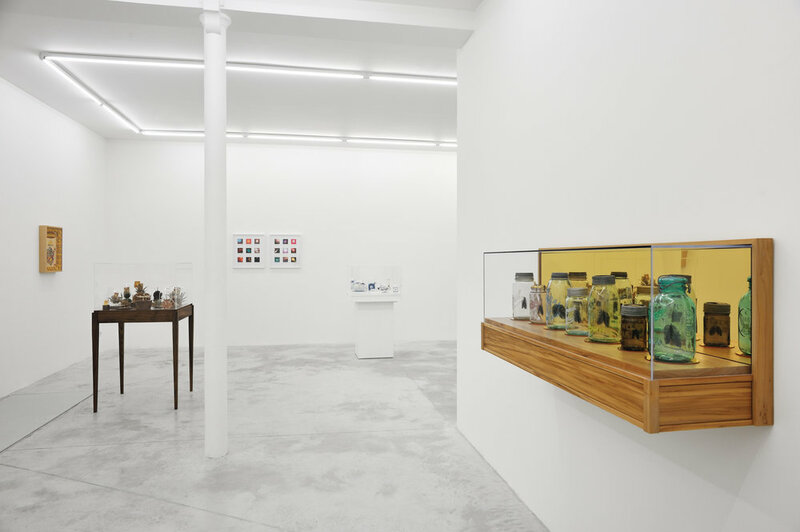 In preparing this exhibition, Robleto has continued investigating his themes of choice: music, science and the notions of absence, death and resurrection. In ‘The Dismantled Sun’, Dario Robleto has taken a particular interest in the connection between that feeling of wonderment and the pleasure that comes with the discovery of the beauties of nature, and the pleasure that results from music and the typical behaviour of fans and their devotion to a singer or band. 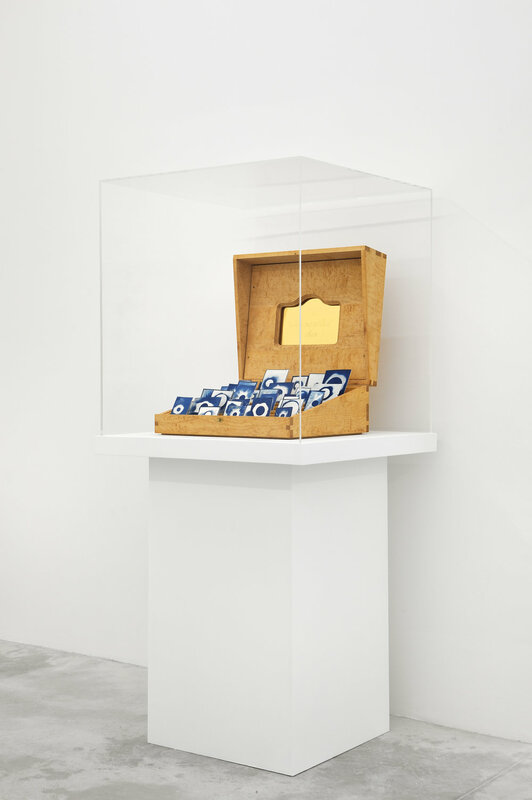 The main component of ‘The Dismantled Sun’, the piece which gives its name to the exhibition, is a small wooden box containing a collection of cyanotypes representing historical drawings of solar eclipses by different astronomers. 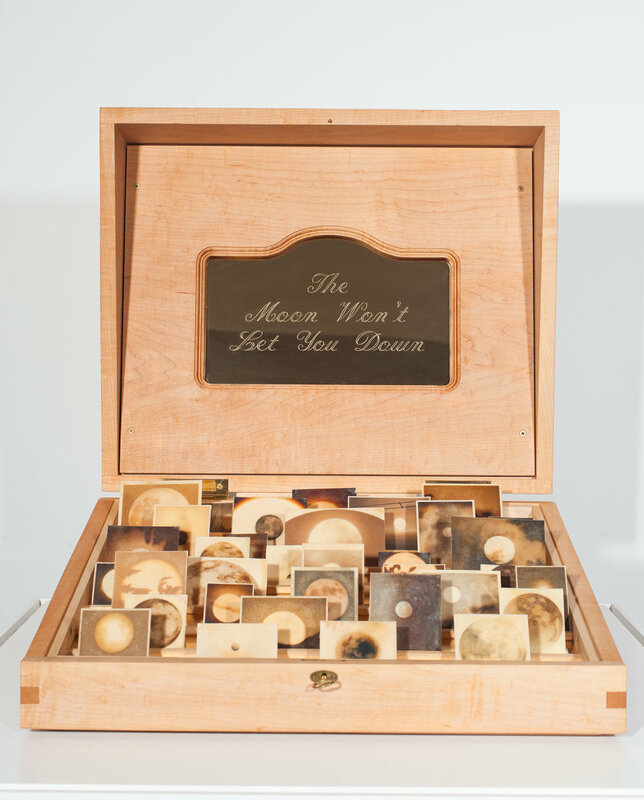 The small box in ‘The Moon Won’t Let You Down’ contains Van Dyke prints of ‘super moon’ photos (where the new or full Moon coincides with the satellite’s orbit bringing it the closest to the Earth). In the early days of photography, represented here by the artist’s use of these two early printing processes, cyanotypes and Van Dyke, one of the greatest challenges facing those who took a passionate interest in the sciences was to capture the light of the celestial bodies: the Sun, the Moon and the stars... For Dario Robleto, this quest is the metaphor of a more up-to-date difficulty - the music buff’s desire to capture something real and authentic in our increasingly digital world, as digital is pervaded with a feeling of distance. The only real way a fan can grasp a moment of reality is during a concert. In ‘Untitled (Shadows Evade The Sun)’, the artist uses a collection of photos taken by fans during different concerts. All that can be seen however are the stage lights; the actual artist is nowhere to be seen. These amateur photographers probably missed their shot because they were jostled by a movement in the crowd. Instead of the photo of a star, they only managed to photograph the star’s absence and yet, they unintentionally captured something just as meaningful: the light illuminating the singer. What a strange coincidence that ‘star’ is exactly the word we use to describe these celebrities! The very existence of these photos leads us to consider another issue evoked by Dario Robleto in his work. Is it not more and more difficult to find such images? Today we tend to sort through our photos before they are printed and not after as was previously the case. ‘Accidents’ are almost systematically deleted. This observation about our digital society is even more pertinent in the realm of music where the analogical/digital opposition is a recurrent debate. 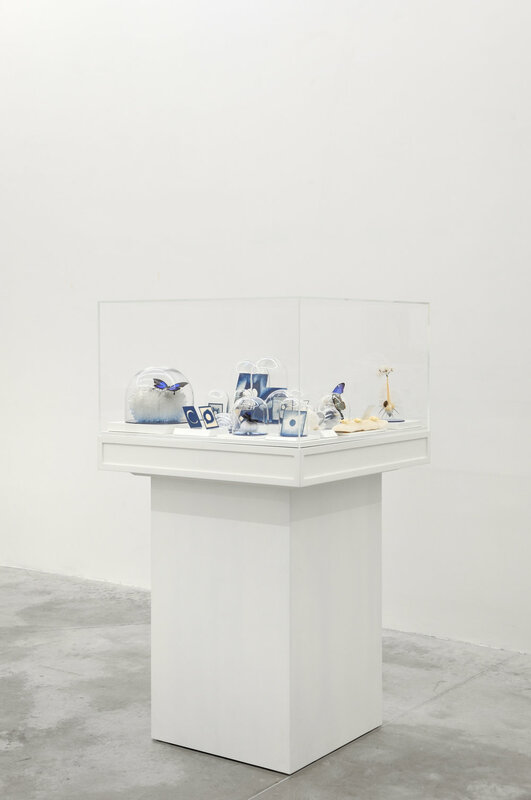 If Dario Robleto doesn’t take position, he nevertheless portrays vinyl records and tapes as things of the past, things that have been forgotten or are long dead and transformed into something else. 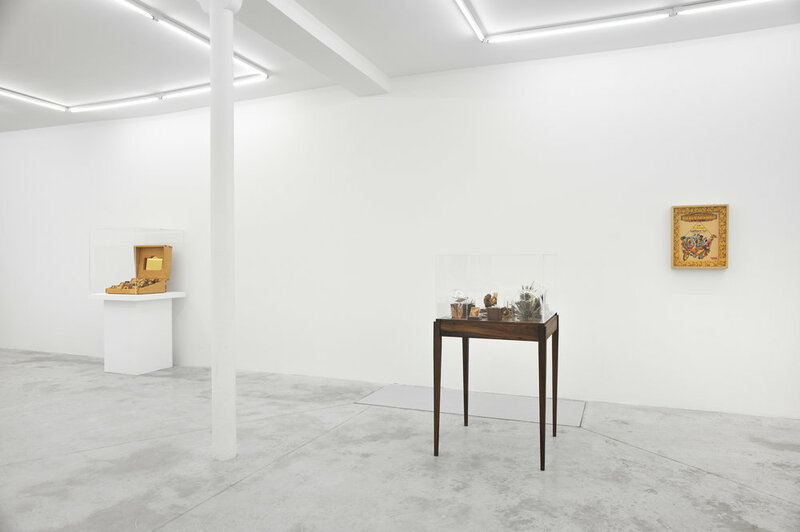 In ‘The Half-Life of Light’, the artist has pulled out and stretched the tape from audio cassettes of the first and last recordings by various musicians, then given it the form of feathers: one feather for the first recording and one for the last, summing up an entire artistic life in two feathers. These musical supports of the past provide material for numerous other works in the exhibition: in ‘Lyrics Search for The Sun (Study For)’, a fragment of a Beatles record, corresponding to the track ‘Here Comes The Sun’, metamorphoses into a butterfly’s antennae; in ‘Things Placed in The Sea, Become The Sea (Study For)’, old vinyl records are crushed into powder and melted, before being used to fill the body of a sea urchin. Associated with nature, and particularly Man’s former discoveries (the seabed, entomology etc), our musical heritage evolves and comes back to life as a new hybrid life form. 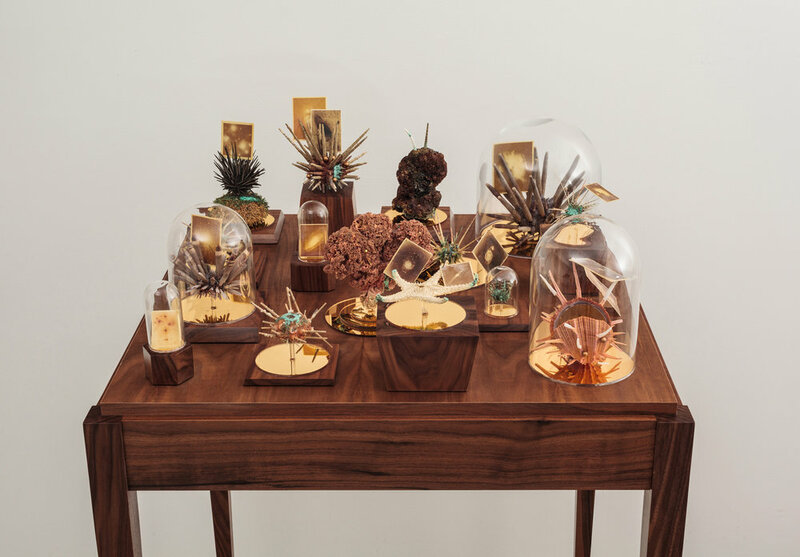 And yet for Dario Robleto, it would be too easy to reduce nature to its sole capacity of assimilation. The artist compares nature in general, and the Sun in particular to the creative process and without a doubt, the most meaningful example is ‘The Sun Makes Him Sing Again’. 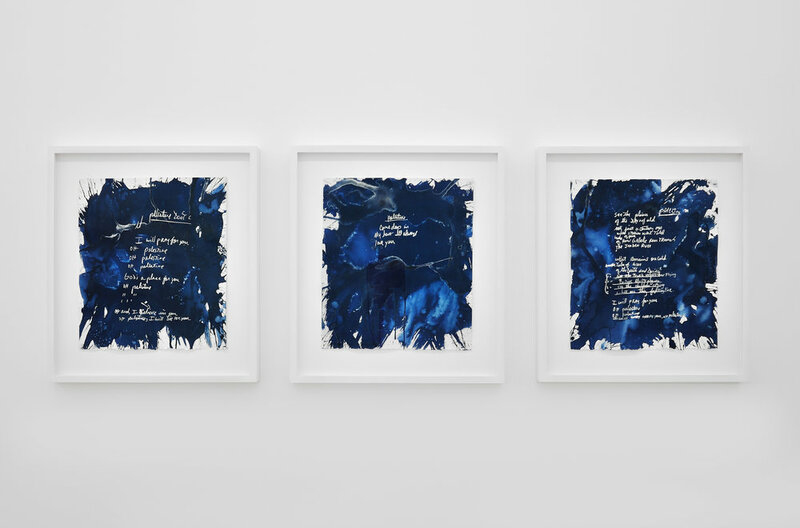 The accompanying caption, as is usual with Dario Robleto, says it all: a three-part cyanotype with sunlight and ghost images of the original handwritten lyrics of an unreleased Michael Jackson song. Using the cyanotype printing technique combined with sunlight has a symbolical role here: it breathes a breath of life into these unknown lyrics by a dead singer, highlighting ‘what might have been’. The question is therefore legitimate: what if Sun Ra (the musician that Dario Robleto evokes in ‘Shadows Evade The Sun’) was right and ‘Space Is The Place’*? *The title of a 1972 album and song by Sun Ra.